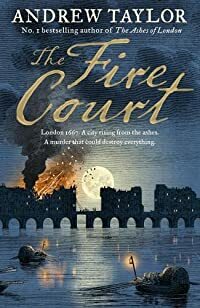 The Fire Court by Andrew Taylor was published in 2018 and it’s the second book in his James Marwood series which is set just after the Great Fire of London. The previous book in this series is called The Ashes of London and in that one Marwood’s future seems much brighter as he has been noticed by the king, but his elderly father is a problem and he’s beginning to wander from home and get into trouble. It’s 1667 and The Fire Court has been set up to settle all disputes between tenants and landlords of property which had been burnt in the Great Fire. In Marwood senior’s latest wander he thinks he has seen his wife Rachel in the distance, forgetting that she is long dead. He chases after her and eventually finds himself in the building where the Fire Court is held. But when he tracks down Rachel in an upstairs room he realises it isn’t his wife at all, but worse than that – the woman is dead – there’s been a murder. But when he tells his son James about it, James is sceptical to begin with as he knows his father is becoming more and more confused. It isn’t long before James thinks that his father’s tale just might be true and so begins in investigation which leads to danger for him and his young assistant Cat Lovett. This was another enjoyable read, so atmospheric of London as it must have been post the Great Fire. I see that he has published another one in this series – called The King’s Evil so I hope to get hold of a copy of that one soon. Reading Andrew Taylor’s Wiki page I was really surprised to see that he had written the Bergerac books which were televised back in the 1980s, although he wrote those under the name of Andrew Saville.